Home » Houston Car Accident Lawyers » What are Acceleration/Deceleration Injuries? 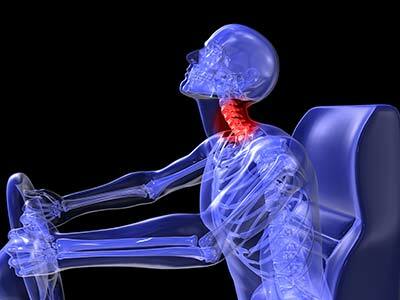 The most common injury resulting from car accidents is whiplash, accounting for 80 percent of all car crash injuries. Whiplash is considered an acceleration-deceleration injury, which can include whiplash, shoulder injuries, and traumatic brain injuries. Rapid acceleration and deceleration in car accidents can be caused a variety of different ways, but most commonly occurs when an abrupt change in speed occurs. This can happen when a driver is parked or at a stoplight and his from another vehicle from behind, or when a driver in a moving vehicle hits another car or stationary object, causes the car to suddenly stop. These types of injuries are very common and will typically cause the head, neck, and surrounding muscles to be stretched beyond their normal range of motion. The most extreme cases of whiplash can cause neck fractures, brain injury, and can be incredibly painful and are associated with long recovery times. While whiplash is the most common injury associated with car accidents, it’s also often ignored or mistreated. This is because what may first feel like a “sore neck,” or sore muscles in the shoulder immediately after a car accident, can later become a serious case of whiplash. When a muscle is “strained” or feels sore, it like means the muscle is slighted torn. When a muscle is diagnosed as sprained, it can be either stretched or torn. Most whiplash injuries involve small tears in the neck muscle that can be incredibly painful and temporarily disabling. Often, car accident victims who experience whiplash will also suffer from “myospasm,” or sudden and painful contractions of the neck muscles. Medical experts agree that failure to properly treat whiplash can also lead to chronic psychosocial conditions such as depression and anxiety. Severe cases of whiplash can lead to traumatic brain injuries. This can happen when whiplash occurs and the brain suffers a sudden and harmful impact against the inside layers of the skull. To determine if a car accident victim has whiplash, he or she should have both a physical exam and a CT scan or X-ray. In the most severe cases, traumatic brain injuries can be physically apparent because the victim’s motor skills and speech may be impacted. If the brain swells and bruises, a traumatic brain injury could possibly be life threatening. Concussion – The most common type of traumatic brain injury, concussions are most often caused by whiplash. Contusion – Caused as a result of a direct impact to the head, contusions are bruises on the brain. Large contusions may need to be surgically removed. Coup-contrecoup – This type of traumatic brain injury is a contusion that occurs both at the site of impact on the opposite side of the brain. Diffuse-axonal Injury – This injury can be caused by a strong rotation of the head, such as when produced by the rotational forces of a car accident. This causes extensive tearing of nerve tissue throughout the brain. Penetration – This type of injury is caused when fragments or objects force themselves into the brain, and usually signal very violent impact or collision. Shoulder injuries are common for a variety of reasons, mostly because the shoulders contain many small and delicate muscles, bones, nerves, veins, and arteries that all contribute in important ways to make the shoulder move and rotate correctly. The most common type of shoulder injury however, involves the muscles, tendons and ligaments. These muscles are injured when whiplash occurs. Tears of the shoulder muscles can be very painful and inhibit mobility. The most common, tears to the superior labrum, limit mobility considerable because it occurs at the point where the tendon of the biceps inserts into the labrum. Overall, acceleration-deceleration injuries can be incredibly painful, bothersome, and significantly limit a person’s ability to perform daily tasks. Traumatic brain injury can be deadly, and can take years to recover from. If you think you have suffered from any of these injuries as a result of a car accident, or think that you exhibit some of these symptoms and you have been misdiagnosed, it’s important that you contact a legal expert to help you evaluate your options and get a second opinion to get you back on the right track and living your life again.